Can you learn to sing from YoutTube videos? 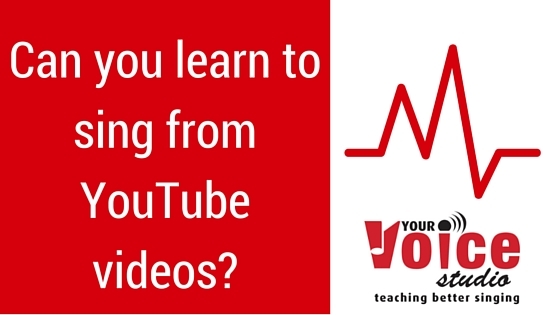 You are here:Home Uncategorized Can you learn you learn to sing from YouTube Videos? I see this come up on my Facebook newsfeed all the time – adverts for singing lessons on YouTube. Usually it’s sponsored adverts targeting my frequent website visits, or google searches for various songs or lyrics. I’m sure you have too, even if you haven’t clicked on any links! So, what’s the big deal with these online lessons you can find all over YouTube? New students come in to tell me they’ve gone through X company’s videos and still aren’t getting anywhere with their voices, or that they’ve followed the advice that Y gave when he answered a question in a pre-recorded video and it hasn’t worked out for them. Nobody can understand why, because it seems like such great advice! So, why is that? There is one big catch with the advice and exercises in these videos. They are designed to give very generic advice to a lot of people, so they are not tailored to your specific voice or problem. After watching several videos, maybe not even by the same person, you are left to piece together bits of advice that you think might help you. So you end up with something that “sort of works, but not really when you think about it”. Don’t get me wrong – some of the advice in these videos is accurate, but only if you know what you are talking about. What you need, and it’s something you don’t get from these videos, is a personal assessment of your voice or vocal problem. Without it, you’re left to assess your voice yourself with very little guidance, or follow a generic lesson plan that you hope will work. Either way, if you get the initial assessment wrong, chances are you aren’t going to be able to get better at singing with those videos. You’ll be working with generic exercises, or even ones that for your particular, individual voice might not work at all. Worst case scenario, you end up making your voice worse, so that when you go to a teacher in real-time, they have to unravel what you’ve done to be able to fix the initial problem. And the initial problem might not have been so bad in the first place! Go to a teacher in real-time who will give you an accurate assessment of your voice, and exercises tailored to help you with any problems. Chances are, you’ll find it 100% more effective than watching a video online that was designed to help a lot of people a little bit. Just one private lesson with a good teacher will be designed to help one person a lot – you. Remember, your voice is unique to you, and won’t work the same way that your friend’s voice will, or even your twin for that matter! If you are thinking about shelling out $200 on an online singing program, you might want to re-think your decision. Your money would be better spent at a studio near to you with a teacher that can see you in real-time. You can always record the lesson and listen back to it later! If you find that the teachers in your area aren’t being very helpful, consider taking a lesson over Skype. Skype is a free internet calling application that will allow you to connect with a teacher that can help. It doesn’t cost you any extra, and you can have your pick of teachers from around the globe. Here at Your Voice Studio, we teach students over Skype in the UK and Europe, and we also take our own lessons over Skype with teachers as far away as Australia! Even if you are on a tight budget, this option is always better. The more tailored the exercises are to your voice, the faster you will overcome any problems and you will see immediate progress. You don’t need to take lessons every week to see progress, you can budget them into 1 lesson a month if you need to. You’ll still make more progress because the lessons are designed to help your unique voice. So, can you learn to sing from YouTube videos? I haven’t yet come across anybody that has successfully done so, but please feel free to comment below if they have worked for you! I would be interested to know which lessons you followed and how they have helped you. Get in touch to tell us your opinions on the subject – find us on Facebook, Twitter and Google+.